"Now this is not the end. It is not even the beginning of the end. but it is, perhaps, the end of the beginning." How apt are those patriot Churchill's words now, as we reach meltdown. Reams and reams have been written on the whole Federal EU State project which first infected the United Kingdom in 1973, with Heath's and his Civil Service backed treachery. Many, many bloggers have railed against not only this edifice but it's participation in the globalisation of trade and commerce and it's inevitable politicisation and inevitable collapse. Many have scoffed at the idea that this monument to greed and dominance could ever fail. Well the blast has been set off. All we cannot know is the effects and range of the fallout. As the nuclear ""wind is the most difficult factor to predict. Different altitudes through which a particle falls may have different wind speeds and directions that affect the final destination of the fallout particle. This explains how fallout can occur miles upwind of a detonation." David Cameron will be busy burning the midnight oil to placate those about to reap the fallout. Not once will he touch on the reasons for this explosion. His and generations of political traitors. All consumed with their own ambition and caught up in the new World Order utopia. One they got to choose who might inhabit. Well, guys, you were so wrong. Your incompetence, shared with your fellow arrogant fools, at many a feast and banquet, at others expense, might feel you'll be OK. You may be but not all of you will escape the wrath of millions about to be burnt horribly and suffer lifelong agony for your stupidity and hubris. One thing is for sure, it is the end of your beginning and paltry efforts to force a federal Europe none of it's Nation States peoples wanted. Free trade was hi-jacked by the political classes. It's corruption envied and admired. It's union with global predators and experimental oligarchs to split the atoms of natural trade and existence has come to its inevitable climax. A financial holocaust and a fission of failure magnified beyond even their control. It's every man for themselves, now. Call it what you will, as the searing hot wind roars through the world's economies it will be those that are the fittest that will survive. 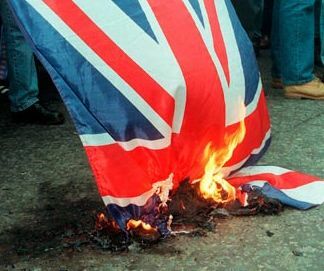 Thanks to decades of political decline, weakness, corruption and lack of morality, The UK is not one of the fittest. God help us all. Our Government will not. In the event of Greek Spring, or even a PIIGS Spring, will the EU send Forces in support of the democratically elected Government? If so, whose? Can't see the Germans being very keen. Hi, Banned. heavy metal of the howitzer sort is my preferred option!